Look at us. Packed into a gleaming dot. 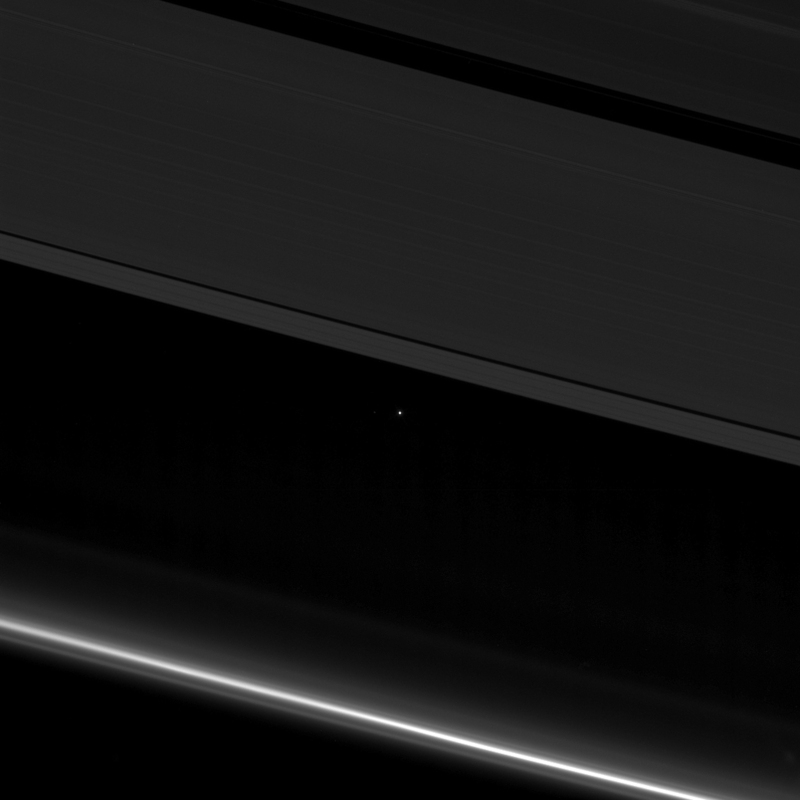 The entire planet nothing more than a point of light between the icy rings of Saturn. The rings visible here are the A ring (top), followed by the Keeler and Encke gaps, and finally the F ring at bottom. 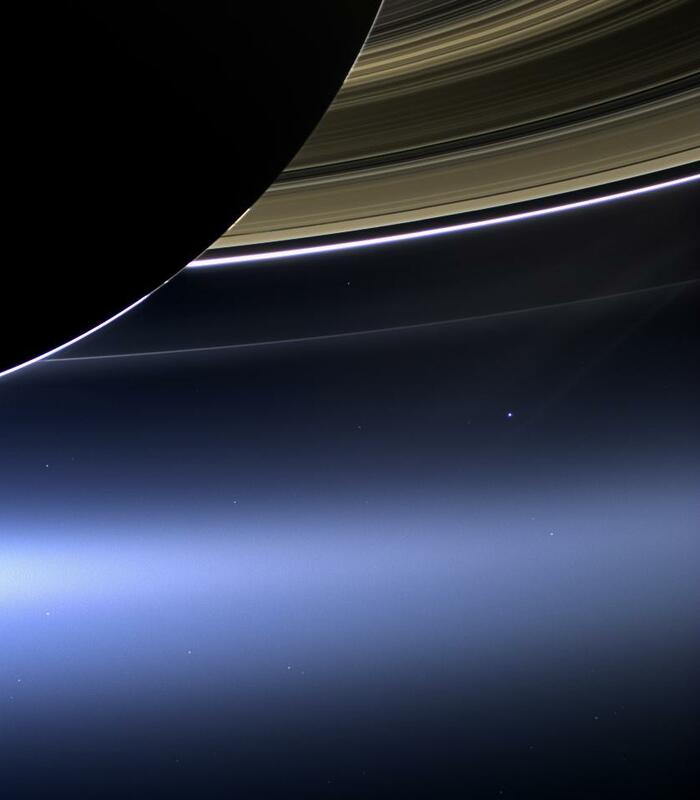 During this observation, Cassini was looking toward the backlit rings with the sun blocked by the disk of Saturn. Seen from Saturn, Earth and the other inner solar system planets always appear close to the sun much like Venus and Mercury do from Earth. All orbit interior to Saturn; even at maximum elongation, they never get far from the Sun. Early this month, as viewed from Saturn, Earth was near maximum elongation east of the sun, thus an “evening star,” making it an ideal time to take a picture. Opportunities to capture Earth from Saturn have been rare in the 13 years Cassini has spent orbiting the ringed planet. The only other photo I’m aware of was snapped on July 19, 2013. Each is a precious document with a clear message: we are all tiny, please let’s be kind to one another. We’ll soon miss the steady stream of artistic images of Saturn, its rings and moons by the Cassini team. The probe will make its final close flyby of the planet’s largest moon, fog-enshrouded Titan, at 1:08 a.m. April 22, at a distance of just 608 miles (979 km). That night at 10:46 p.m. CDT, Cassini will enter the first of its Grand Finale orbits, a series of 22 weekly dives between the planet and the rings. The first ring plane crossing is slated for midnight CDT April 25-26. The coming week will be a busy one for Cassini. On each orbit, the probe will draw closer and closer to the butterscotch ball of Saturn until it finally tears across the cloud tops and burns up as a spectacular fireball on September 15. Scientists would rather see the craft burn up in Saturn’s atmosphere instead crash into a moon and possibly contaminate it. After nearly 20 years in space, seven of them spent traveling to the ringed planet, Cassini feels like family. It won’t be easy to say goodbye, but thanks to the probe, Saturn’s family album is bursting with remarkable images that will forever remind us the tenacity of this amazing machine and the vision and work of those who kept it operating for so many years. In the Apr13 picture the Earth size and distance to the moon seem wrong; moon is too close or Earth is too big. Are you sure that’s us? It seems to me that the Earth-shine is responsible for a bigger apparent size. About the Moon, that “short” distance could be caused by the its position relative to the Sun, the Earth and Saturn. On the 13th, the Moon was almost full, so it was in opposition to the Sun relative to the Earth. This might justify the position of the Moon in these images. That’s us alright. Earth and moon appear so close because from Saturn’s perspective, the Earth-moon system is incredibly far away. As to the Earth appearing too big, that may have to do with overexposure — the Earth appears larger in order to expose long enough to record the much fainter moon. When Cassini burns up in the Saturnian atmosphere will happen to the plutonium-238 dioxide in Cassini’s three radioisotope thermoelectric generators (RTGs)? Will it be dispersed in the atmosphere? Will it eventually sink to Saturn’s core? Have the physicists on the Cassini team made any (public) statements regarding this matter (pun intended). Previous PostPrevious Is This The Exoplanet Where Life Will First Be Found?